When you take care of your dog, you are rewarded with friendship, loyalty and unconditional love. As well as ensuring they are well fed and exercised; it also involves safety when handling and housing them, but also carefully monitoring their health over time. However, it is not always easy as it can be stressful when your dog is ill and suffering. To help give you a greater understanding of what is happening, there are five common health issues that you should be aware of. Although it is not a disease, diarrhea is more a symptom of an underlying condition. This could be something very short term and acute and related to their diet. It is likely to pass by quickly. You need to look our for other symptoms though, such as vomiting or if they are feel uneasy, lethargic and have lost their appetite. Diarrhea could be a sign of a more serious illness. Look out for recurrences and make water readily available. If the diarrhea doesn’t pass and your dog shows signs of other symptoms, it could be a move serious condition. In this situation, take them to your local vet. Your dog may have an ear infection if they are shaking or tilting their head a lot. Another symptom or sign is rubbing or scratching their ear. If you see your dog doing any of these things, take a closer look around their ears for redness, swelling or discharge. Also check for any bad odors and if there is a combination of any of these symptoms, it is possible your dog has an ear infection and needs to take a trip to your vets. Dogs commonly suffer from ear infections, particularly breeds with ears that flop. As their ear canals are vertical, it makes them much more susceptible to contracting infections, as it makes it east for microorganisms, foreign objects and unclean water getting trapped. All of which can cause infections. Your vet or animal hospital will need a swab taken from the area and inspect their inner ear. Insecticide, antibiotics and fungicides can be used to treat ear infections, depending on what caused them. 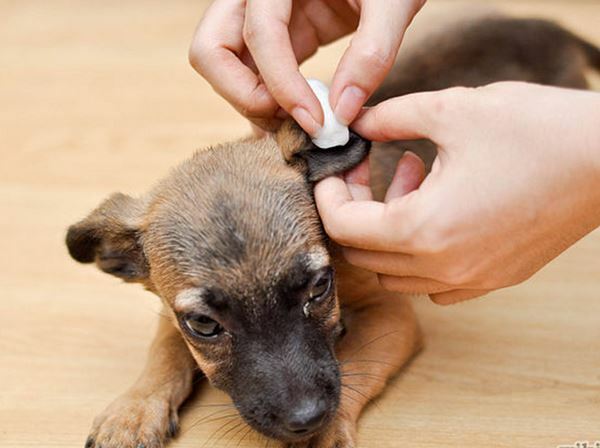 You could also make sure that you have some ear dog-ear cleaning products in at home to make sure their ears are always clean. Fleas are incredibly common are very easy to spot. The first thing to look out for is your dog biting, licking or scratching at their coat or skin. If they have an infestation that has gone on for a long time unnoticed, this might become clearer if you notice skin irritation and abrasion signs or the loss of fur. Check your dog’s coat regularly for fleas, looking out for dark droppings and eggs. Around the ears, the neck and tail base are the most common areas. Vets will provide your dog with an oral treatment if it is a more serious infestation. A simple flea treatment in the form of a liquid can be applied to your dog’s skin, which deters adults from staying on your dog’s body. Along with treating your dog, you need to also think about the environment they live in and if possible, remove or replace bedding and vacuum around the places they frequent, disposing of the dust collected carefully. After treating your dog’s flea problem, make a habit of using spot-on treatment every 4 to 8 weeks to prevent a recurrence. As flea’s lay eggs that mature, the cycle begins once again, so break this cycle. The first sign you may be aware of with hot spots is a small area of irritation in the form of an insect bite. That small issue can become worse if your dog scratches or itches around the offending area. In time, this can develop into what is known as a hot spot, also referred to as acute moist dermatitis. Hot spots are irritated, moist skin, that can sometimes ooze and cause matted hair. Other causes for hot spots can be something dog’s environment, poor grooming, fleas or allergic reactions. When your dog suffer from this, they will scratch and itch at it until it worsens and causes a more serious irritation of the skin, which can lead to nasty infections if untreated. Treating hot spots normally involves having your dog’s matted hair clipped, cleaned and dried sufficiently. Then applying a light disinfectant. If there are severe hot spots, cortisone can be applied. Your vet will be able to advise what is the best course of action. Although if your dog vomits on occasion, this is not anything you should be worried about, especially if they are an otherwise healthy animal. However, if you it appears that your dog is vomiting more often, it is important to be on the lookout for more symptoms of distress and discomfort. It may be that normal dietary issues cause vomiting. Be sure to look for sings of diarrhoea, blood or any other changes in your dog’s behavior, as these can all be signs of more serious problems. Vomiting is caused by various diseases, toxins and even infections. Therefore, if it persists, it is a good time to visit the vets.